Rows of freshly planted garlic. Today was garlic planting day here at Good Life Ranch. It feels good knowing that the first crop of 2011 is in the ground! We ordered seed garlic of several varieties from an organic nursery back in August. After months of delays caused by the company losing our order and not returning our phone calls, yet being organized enough to put the charges on our debit card, we finally got our garlic in mid-November. The company we used was Irish Eyes Garden Seeds, and although we eventually got the garlic we ordered, I can’t say that I recommend them based on the customer service the company gave us. Took the money, lost the order, claimed all of their office computers crashed, did not return phone calls, would not call back when they said they would. All in all, I hope their garlic does better than their sales and service personnel. I wanted to plant the garlic in mid-to-late October, but due to the shenanigans with the order and the company that wasn’t able to happen. Then I thought it might be a good activity for when my family was visiting us over Thanksgiving, but due to the appendectomy, that wasn’t able to happen either. THEN we had 6 inches of snow that I didn’t want to plant through. So we finally got the garlic in the ground today. Old European tradition says to plant garlic on the shortest day of the year – December 21st. I know that’s not til Tuesday, but we’re supposed to get more snow and I didn’t want to waste the relatively nice weather we had today (a balmy 31°F). We planted 5 varieties of garlic – large elephant garlic, Spanish roja, German red, Nootka rose, and Inchelium red. I planted a dozen cloves of the elephant garlic, then almost a pound of each of the other varieties. Each clove went pointy side up 2 inches into the ground spaced 5-6 inches from any other clove. I planted the elephant garlic a little further apart since they are so large. All in all I think I planted 9 rows of garlic this morning. After planting the rows I raked a thick layer of leaves and straw over them, then watched the chickens proceed to scratch it all up. Hopefully they won’t disturb the cloves too much. The garlic should overwinter in the ground and pop up and begin growing early in the spring. If all goes well we should be able to harvest some green garlic shoots sporadically throughout the spring before we harvest the garlic bulbs in July and August. The other order of the day was to move the goat herd into a holding area. We’re going to visit my family in Arkansas next week for the holidays and want caring for the goats to be as simple as possible for our farmsitter. We hired our young neighbor Darrell to watch after the goats, livestock dogs, rabbits, and poultry for the 3 days we’ll be gone. Maggie Mae and her protegé Sergeant Pepper survey their new domain. Eventually we want to build a hayshed for feeding livestock in the winter so that we can collect and compost their manure before respreading it in the spring (when the pasture can actually take up the nutrients). 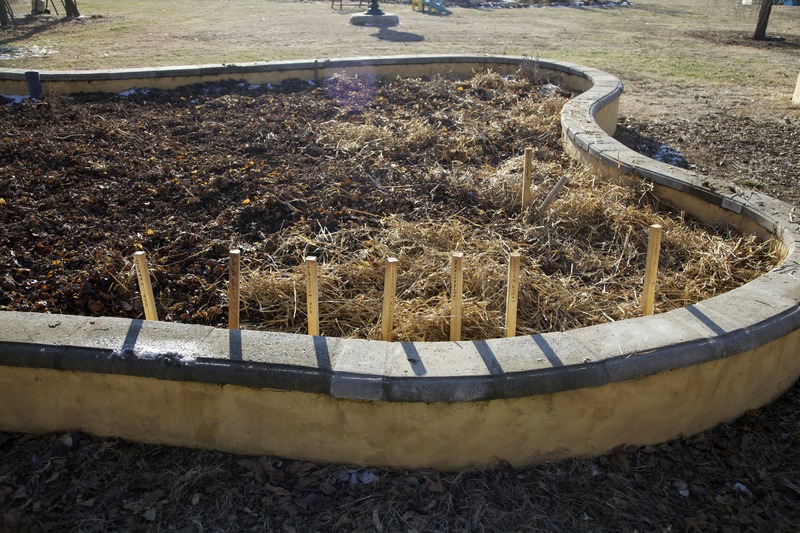 Manure put on pasture in the winter sees its nutrients vaporize or leach into the water long before the plants begin growing again, so we want to collect and store those nutrients in the winter so we don’t have to import our soil’s fertility in a bag. However, we’re a little short on hayshed money right now, so this is our next best option. A view of the entire goat corral. We got some cattle panels and attached them to T-posts to make a 48′ x 90′ holding area for the goats. We moved their shelter with hayrack into it. 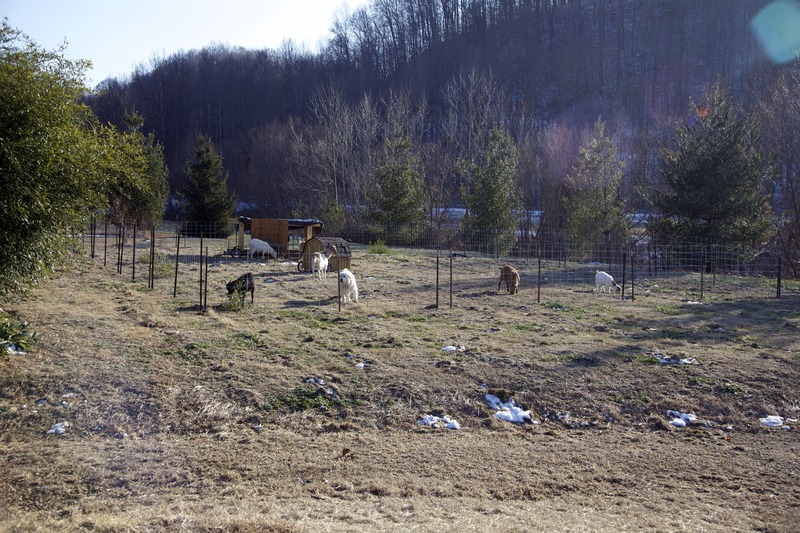 The plan is to hold the goats in this area and feed them hay when the weather is bad this winter (or when your 13-year-old neighbor is farmsitting), and move them around with the portable fencing when there are a few days of nice weather. We strategically placed the hay feeding area in a “living barn” of sorts. The area is shielded from the north wind by the thick stand of bamboo. Two other sides of the enclosure have pine trees to protect it. So basically the goats are shielded from the weather on 3 sides and have their portable shelter in with them to boot. Corral, corral maker, goats, and guard dogs. To move the goats today we employed our successful strategy from the Great Goat Escape of 2010, which is to say that I caught lead goat Miss Priss and led her into the new corral. The other goats followed along just like the other day and before we knew it we had the whole herd in the corral. Piece of cake! Guess who can fit through a cattle panel? Sergeant Pepper, that's who! 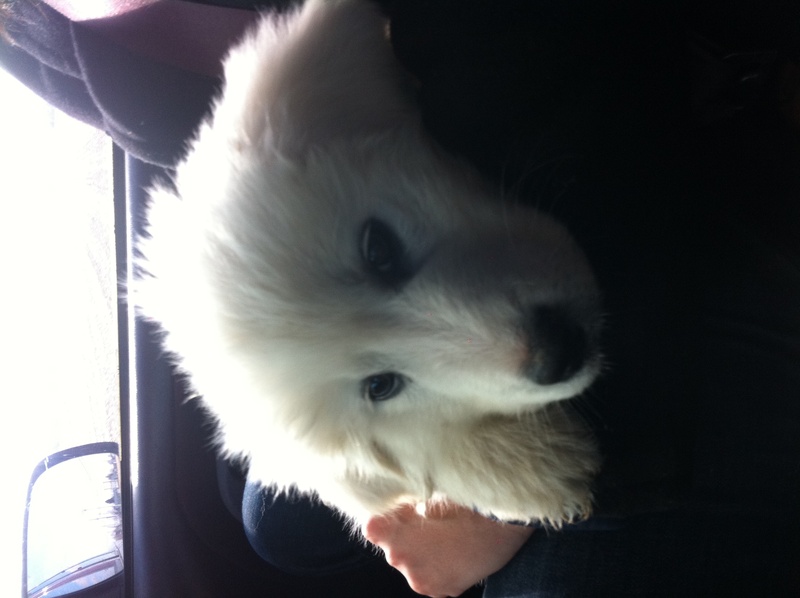 The only glitch in the system is Sergeant Pepper (the new Pyrenees puppy). He is growing bigger by the day, but he is still small enough to slip through the 6″ x 6″ cattle panels. So far this afternoon he had squirmed out at least 6 times. It’ll be nice next week when he’s finally too big to do that and he’ll be forced to stay in that pen and bond with the goats at last. It’s hard to get mad at him, though. He’s so cute! 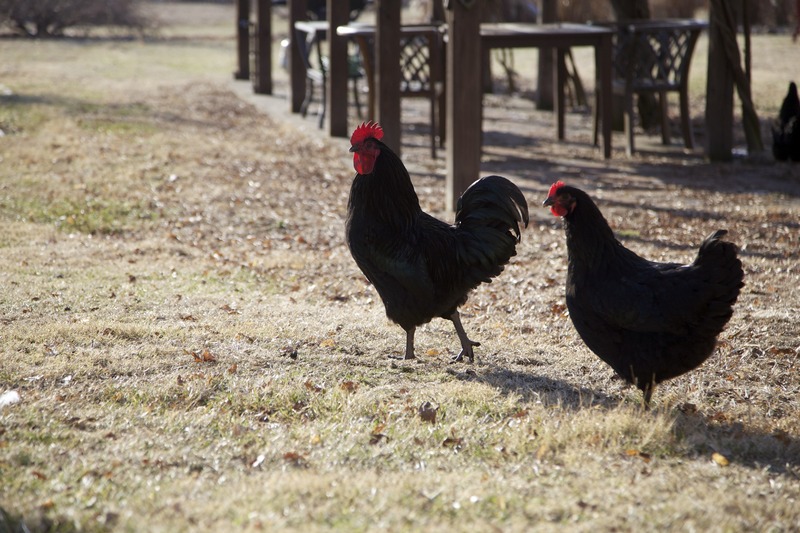 On the poultry front, the chickens are really beginning to lay! Today I found 13 eggs from our 14 hens. The only unfortunate part is that I found them under the trailer, next to the mower, under a bush, on the straw bales… not ONE egg in the milk crate nest boxes. Hmmm…. Gotta figure out a way to convince them that the milk crates are the place to lay the eggs. Collecting them will go much faster if we can do that. BUT, the eggs are fantastic! Even in winter, when the egg yolks are supposed to be very pale compared to the rest of the year, the color in these eggs just blows away the store bought ones. I can’t wait to compare the difference in the spring and summer when the grass is growing. 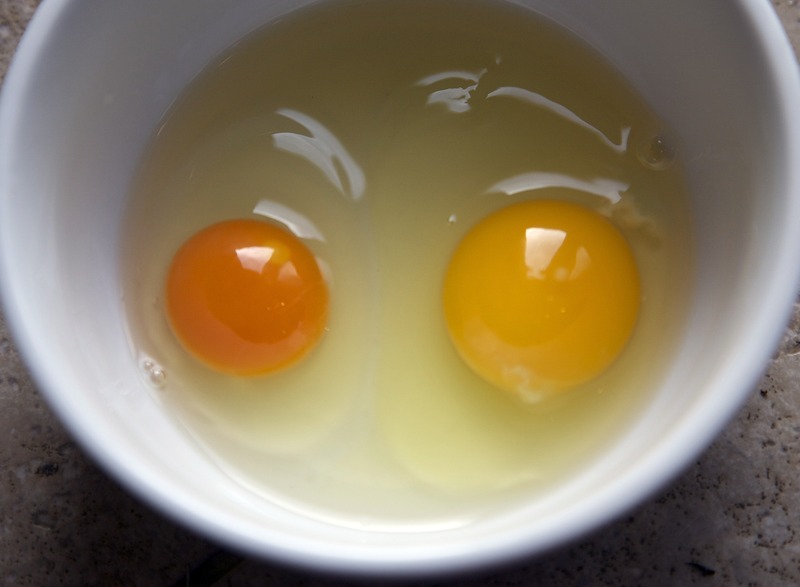 Green plant matter leads to more yolk color. More yolk color means more beta carotene. Check out the difference below. Good Life Ranch egg on the left. Naturally Preferred Organic Cage Free eggs on the right. This is Dec 19. We'll do the comparison again when the grass is green. Good Life Ranch after 6" of snow. Welcome to Lindsey’s first winter! My wife has lived in south Texas her whole life, so we’re calling this her first winter. The recent storm that ripped across the midwest dropped 6.5 inches of snow on our ranch over the last 24 hours. The snow fell slowly as large soft flakes, then ramped up to heavy sheets of tiny flakes, and then settled into a fairly consistent flurry pattern. 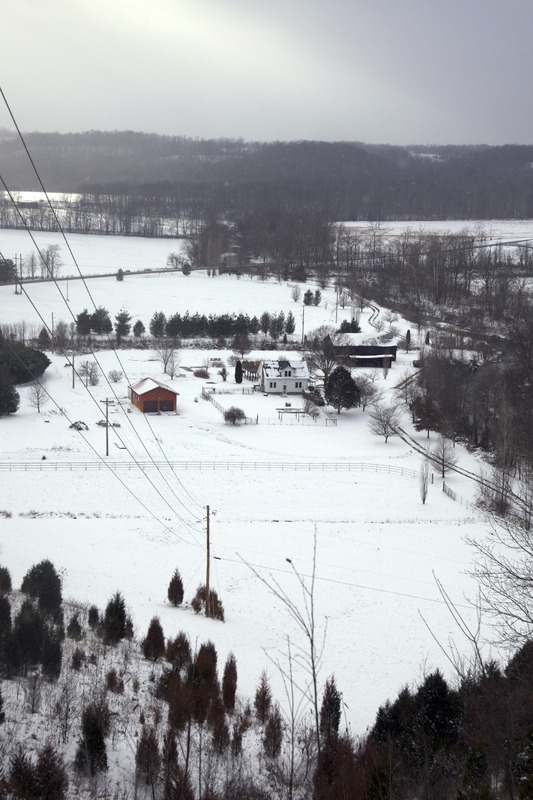 The ranch really looks lovely from the ridge while blanketed with snow. The goats and poultry have definitely changed activity patterns! There’s a lot less roaming around and a lot more hunkering down under the shelter or in the coops. Our Great Pyrenees guardian dogs absolutely love the snow… I think they feel camouflaged so they can sneak up on the coyotes. The chickens pretty much stayed in the coop today rather than scratching around for food, but on the plus side one of the chickens decided that today is the day to lay our first egg! Lindsey found it in the milkcrate nest boxes we’ve got fixed to the wall in the poultry house. We collected it and took it inside where I fried it up. Lindsey and I shared it and I can report that it’s MUCH better than store-bought eggs, even though we buy the cage-free organic eggs from the store. This egg (even though there hasn’t been green grass for weeks) had a yolk that was brilliant orange in color. Amazing! We’ve enjoyed a little romping of our own in the snow. I wish my insides felt better from the surgery because it’s perfect sledding weather and we’ve got half of our ranch covered in large hills! Fancy, Ebony, and Ivory are thrilled with their new hayrack. Well, I’m still on “light duty” from my appendectomy. I’m not supposed to do anything real strenuous yet and since all the things I had planned for this winter were “heavy duty” moving or building I decided to make providing for our goats a little easier on us and a lot less wasteful of hay. Winter feeding of hay is the number one operating expense in most livestock operations, so we want to minimize the amount of hay we have to feed and utilize the hay we feed as efficiently as possible through good management and decision making. In the future we hope to be able to graze our ruminants year round without supplemental hay except in the worst years but we have to get our pastures into much better shape before that can happen. So this year we will have to feed hay to supplement the browsing and grazing of the goats. I thought we were going to be able to make it until January before we had to feed any hay, but we’ve had such a cold snap here lately that the grass is fading fast. The temps here have been in the teens this week – no higher than 28°F on any day – and have been in the single digits at night. So basically we had to start feeding some hay. Since we’re new at all this we started by placing a hay bale on top of a dog house thinking that LGD Maggie Mae could get some shelter and the hay would stay up off the ground. That strategy worked for somewhere between three and five minutes. After that time, the goats had knocked over the doghouse, spread the hay all over the ground, and they and Maggie had made little nests in the hay in which to sleep. Seeing all of the goats and Maggie sleeping in their nests was very cut, but hay is expensive, and that was going to waste a lot of it. From the couple of days I spent carrying hay out to the goats I could tell doing that every morning was going to get really old really quickly, so I started thinking about making a portable hay rack. Lots of companies make hay racks, but I was unable to find one that was designed to be moved around pastures with the animals. Most people either bring large round bales to central feeding points for non-rotationally-grazed animals or they bring their animals into a hayshed in the winter and feed them there. We’ll probably opt for the latter strategy eventually, but we need to build a hayshed and small stockyard first. That way we can store the manure in one place through the winter when the pastures can’t absorb the fertilizer and spread it in the spring when it can be utilized. But for now we have no hayshed and no stockyard, so we needed another solution. As I said, I couldn’t find any portable hay racks to model one after, so I tried to think of the solution that would be easiest for us. 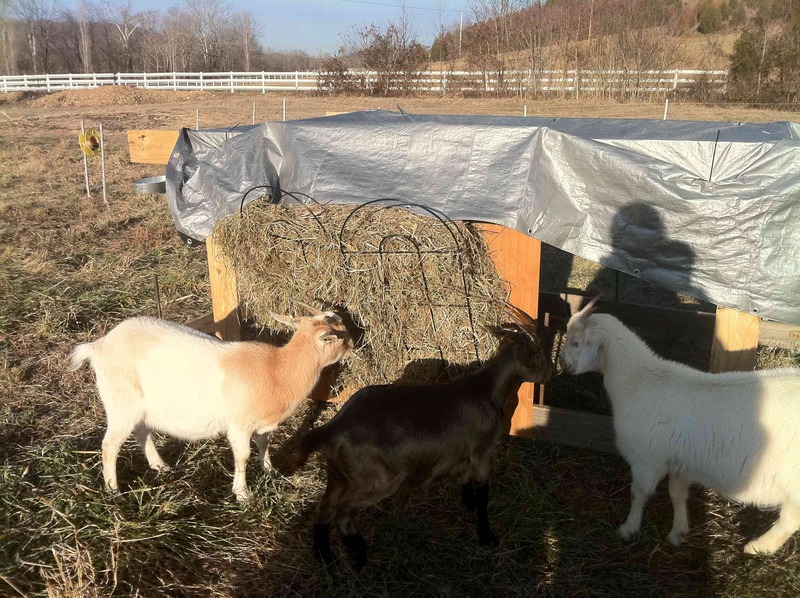 I decided that attaching a hay rack to the goats’ portable shelter would be the easiest thing for us to do since doing it that way would create no extra work in moving it. 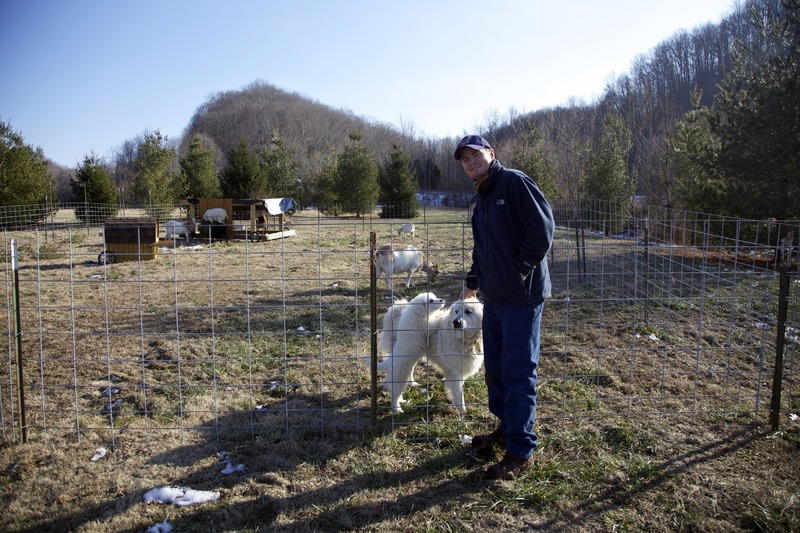 We already move the shelter with the goats anyway – a task that has gotten much easier thanks to my dad, who put wheels on the goat shelter while I was in the hospital. Now that thing pulls so easily! That used to be the worst part of moving the goats, but no more! Anyway, I attached a remnant 4′ x 4′ piece of plywood to one side of the shelter and then angled two old garden trellises that I found into the bottom of the plywood and through the bottom frame of the goat shelter. Then I attached a wire to the top frame of the goat shelter, wove it through the trellis for added support, and attached the wire to the top frame of the shelter on the other side of the plywood. See the video below for a visual. As you can see, this is a perfectly functional poor-man’s hay rack that moves right along with the goat shelter from paddock to paddock. I used stuff we had lying around, but if you want to copy this it would only cost you about $22. A full piece of plywood runs about $8 at Lowe’s and I saw similar trellises at Wal-Mart for $6.97 each. You’d even have a half sheet of plywood left over at that price. Hopefully the goats will be kind to it and not break it to pieces, but I think the worst they could do it bend the wire on the trellises. That shouldn’t be too hard to fix if it becomes necessary. After 24 hours, the hayrack has seemed very successful at keeping the hay off of the ground and at giving the goats access to the hay. Sgt. Pepper rides home in Lindsey's lap in the truck. This cute little fluffball is Sgt. 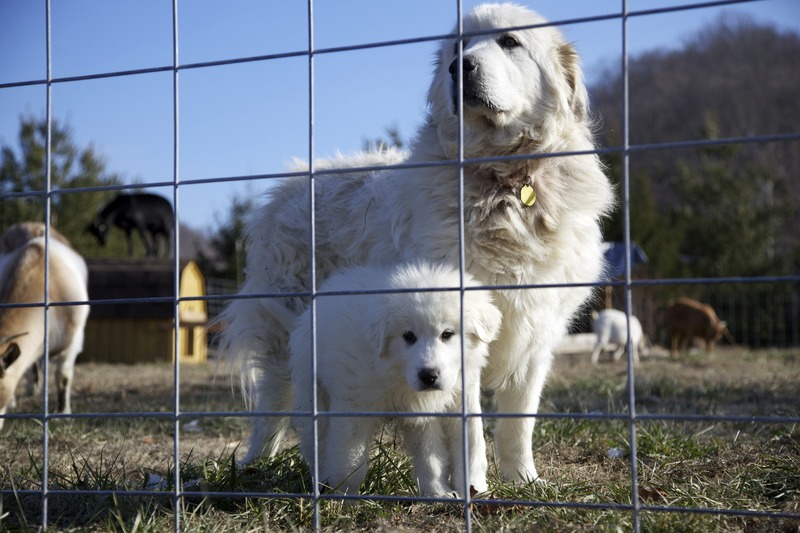 Pepper, Good Life Ranch’s newest livestock guardian dog (LGD). Lindsey’s parents, Ronnie and Jake, had given us some money to buy some young LGD pups for Christmas. This is pup #1! No, Maggie is not being replaced. She is doing a tremendous job! But she is between 7 and 8 years old and it takes 18-24 months to get a LGD trained and working at full capacity. So now is the time to start training a replacement if we want Maggie to be able to retire before she hits double digits in age. We wanted to get 2 young puppies (a male and female so that we won’t have to buy a LGD again, as well as hopefully make a little bit of money to pay for their food eventually) and allow Maggie to train them how to be good guardians. Then, once the younger generation is trustworthy and working at full capacity, Maggie will be able to retire to a smaller area with some geese or pygmy goats or something. We got Sgt. Pepper from a family near Campbellsville. The parents of the litter of 9 puppies were on the premises and were guarding a small flock of goats in addition to raising their litter of puppies. The parents were alert but very friendly, even with strangers. There were 4 puppies still there – 2 males and 2 females. We chose the puppy that seemed the most confident and willing to explore the paddock. He was also a little bit bigger than the others, but that was not as important to us as his personality and self-confidence. Right now he weighs around 12 pounds and will be 9 weeks old tomorrow. On the way home we decided that we would call him Sgt. Pepper. Lindsey also wants a llama named General Fierceness, so apparently she is a fan of military ranks. The Beatles theme for our LGDs could be fun – Sgt. Pepper and Maggie Mae could have friends named JoJo, Jude, Desmond, Eleanor, Michelle, Maxwell, Mr. Kite, Paperback Writer, Prudence, Lucy, Lady Madonna, Rocky, John, and Yoko. I’m also pretty sure I’ve missed many of the names in their more obscure songs, but you get the idea! We also stopped off at one of our Amish neighbor’s and got a well-made doghouse so that Sgt. Pepper could get away from the goats if they try to play too rough while he’s still little. Before we move the goats next I’ll put some wheels and handles on the doghouse so we can move it around the pasture with the goat shelter and Sgt. Pepper and Maggie will have a place of their own that the goats can’t enter. We also learned that his parents live just half an hour or so away from my parents in Arkansas. Small world! Here are some shots of Sgt. Pepper’s first day at Good Life Ranch. Once we got back home, we put some straw in the doghouse so that Sgt. Pepper could make himself a little nest. Then we put him inside the doghouse and put it inside the next goat paddock. We then proceeded to build the goat paddock around the doghouse with him in it. Our thought was that the goats are usually distracted by the fresh grass for a while after a paddock shift and would therefore notice the puppy one at a time over a period of time rather than him being the only new thing in their world. For the most part, it worked. After building the new paddock and moving Maggie and the goats into it, we took care that Sgt. Pepper and Maggie had a good first meeting. Maggie sniffed the entrance of the doghouse and then went around the paddock doing her usual marking and scraping to define her territory. Coyotes beware! After she finished that, we took Sgt. Pepper out of his house and let them introduce themselves. Maggie sniffed him a little but was far more interested in getting attention from us. Sgt. Pepper followed her around a little and explored the paddock on his own a little. I took him across the paddock to make sure he could find his way back to his doghouse, and he was successful! He only needed a little break in the goat shelter at the halfway point. The only negative was the boss goat, Miss Priss. She head-butts all the other goats all the time, and she did that with Sgt. Pepper once, too. He squealed but wasn’t hurt. I was also encouraged that he didn’t run away from her after that either. We’ll just have to keep an eye on that situation over the next couple days. Sgt. Pepper has the doghouse he can retreat too, but if Priss doesn’t leave him be then we’ll put Sgt. Pepper in a smaller area with just Nadine and Roja so he can bond to goats without any danger of getting head-butted. All in all, Sgt. Pepper had a big day. He got his shots and de-wormer, had a nice truck ride in Lindsey’s lap, threw up a little from car sickness (luckily not in Lindsey’s lap), got a new house, pooped in the bed of the truck, met Maggie the mentor, stood up to Priss the goat, and fell sound asleep in the house before dark.